Catholic bishops in England are increasingly giving support to pro-life acts of witness outside abortion clinics. It is a most encouraging sign. 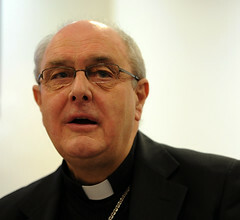 Two weeks ago I reported on a huge pro-life witness in Stratford supported, amongst many others, by Bishop Thomas McMahon (pictured right), the Catholic bishop of Brentwood, who was represented by Monsignor John Armitage, the diocesan vicar general, who is also responsible for three parishes. Your gathering to-day has my unqualified support. Abortion has reached a new height in this country in recent months by the fact that a number of clinics now allow abortion purely according to gender and also allowing private clinics to seek business through television and radio advertisements. With 200,000 abortions a year we already have one of the highest rates in Europe. I am with you in prayer and sprit and may your prophetic stance and prayerful vigil draw attention to this great evil of our time. Then last week I reported that Bishop Alan Hopes, (pictured right) the Catholic auxiliary bishop of Westminster, is due to attend a 40 days for life vigil in central London. I urged (and I urge again) as many as possible to be present this coming Friday to support Bishop Hopes in his pro-life witness. 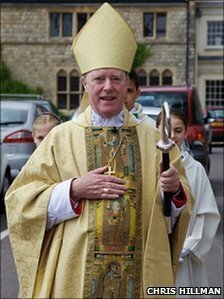 And I have now heard that Bishop John Hine, (below right) Catholic auxiliary bishop of Southwark is joining the vigil at Marie Stopes abortion facility, Brewer Street, Maidstone, Kent ME14 1RV, on Friday, 27th April 2012, the 44th aniversary of the Abortion Act. Bishop Hine is celebrating the 12.30 Mass at St. Francis's Church, Week Street, Maidstone. He is then joining in the vigil which begins with a prayerful and peaceful procession with an image of Our Lady of Guadalupe to the Marie Stopes Clinic and concludes with a return procession at 2.30 p.m. This event is organized by Helpers of God's Precious Infants, an international pro-life group founded by Msgr. Philip Reilly under the direction of Bishop Thomas Daley of New York. Its main apostolate is prayer vigils at abortion facilities. Strong, compassionate, pro-life leadership, such as the leadership shown by these bishops, lays the foundation for a great campaign for life in the months and years ahead. I congratulate the pro-life groups who are winning, by their example, episcopal support. And I thank Bishop McMahon, Bishop Hopes, and Bishop Hine, for their courage in speaking out for the helpless unborn and their mothers.